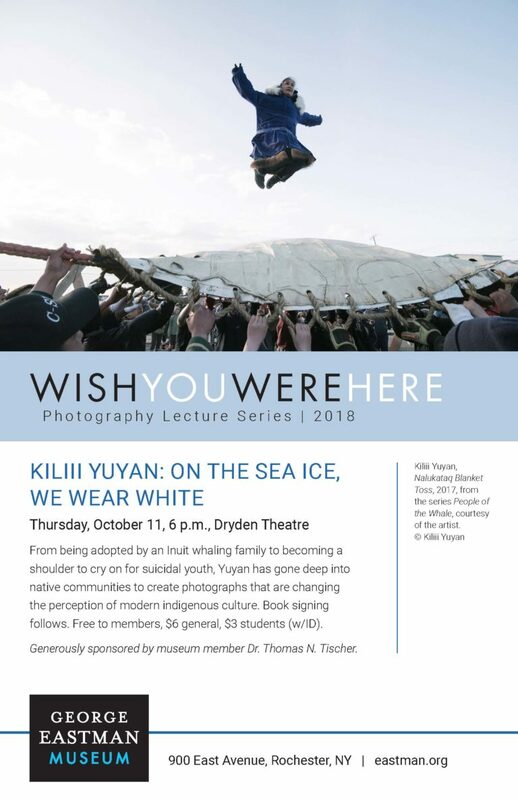 It was an honor to speak at the George Eastman Museum in October about my work with indigenous communities of the Arctic. The recording of the entire talk is now on Youtube. I spoke about the importance of deep cultural immersion in photography as well as the range of indigenous issues that we face in the North- then end with a message of hope for our communities! 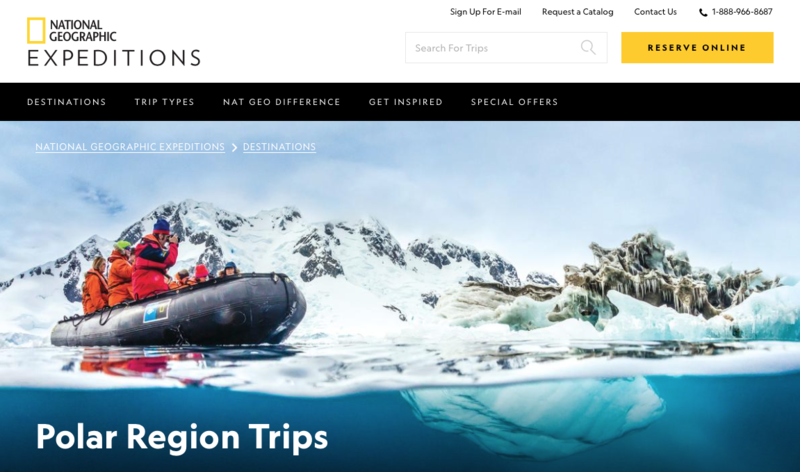 I’m excited to announce that National Geographic Expeditions has brought me aboard as a Photography Expert for the Polar regions. I’ll be part of the team for NatGeo Student Expeditions in Alaska July 2019, and NatGeo Expeditions in the Russian Arctic Summer 2020. 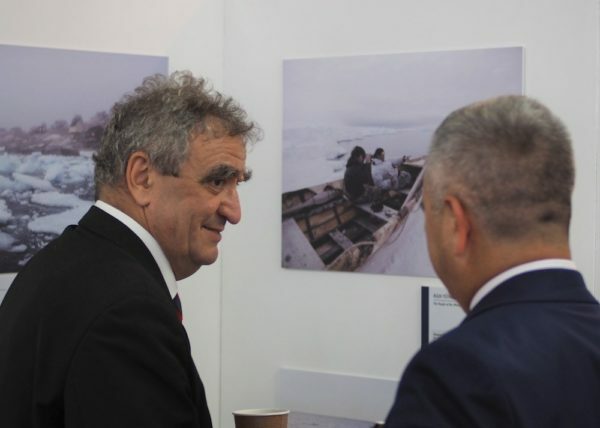 I’m very much looking forward to being able to share my passion for the Arctic and its peoples and wildlife in the next several years. CLOAKED IN SEALSKIN suits, a flock of kayakers cuts across a steely expanse of frigid water. A close observer might catch signs of modernity in the vessels’ construction and the kayakers’ attire, but from a distance, the image appears timeless. National Geographic Travel has just published my story on reclaiming Inuit heritage in Greenland through traditional kayaking. 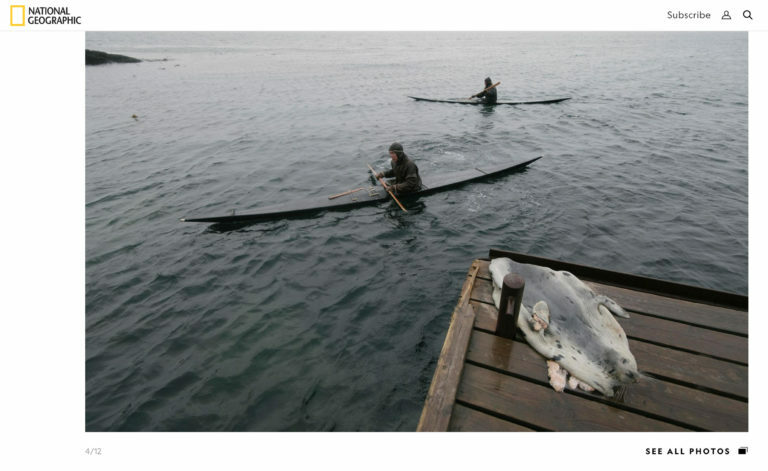 It’s a story that’s been close to my heart for a long time because I am also a traditional kayak-builder and have long run a traditional kayaking business as well as being a photographer. After returning from working on a downer of a story on suicide, I found myself in Greenland only to find my spirits uplifted by what the Greenlanders have achieved in their communities. 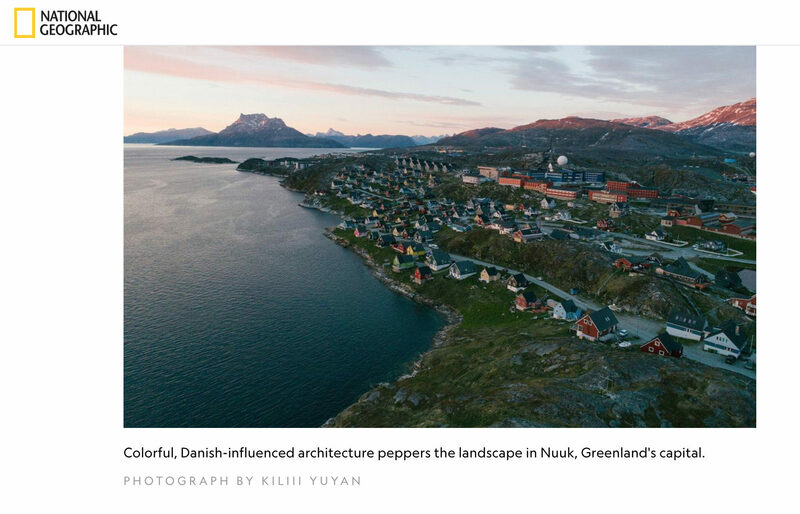 Despite centuries of colonization that has visited horrors upon Greenland’s Inuit population, Greenland is forging ahead with a new and unified national identity. But I wouldn’t say it’s been easy. Greenland had an anti-colonial revolution in the late 1970s that pushed it achieve self-rule from Denmark. Today’s modern thriving economy and high standards of living are directly the result of farseeing elders and the hard work of the Greenlandic community. You can find also more images from my Greenland Renewed project. Thanks to writer Abby Sewell for lending her empathy and writing talents to this story, and photo editor Jeff Heimsath for his compassionate eye. Every spring for the last 4000 years, the Iñupiat people have stood on the tuvaq, the edge of the shorefast ice, waiting for the annual migration of bowhead whales. The whaling season has begun. Bowhead whales were once thought to be a threatened species due to excessive international whaling in the 1800s. However, by the 1980s, Iñupiat whalers had proven that their own understanding of the bowhead whale population was far more accurate than scientists once believed. Today, Iñupiat communities manage hunting quotas of bowhead whales themselves. Unlike whaling in much of the world, the subsistence practices of the Iñupiat people maintain the bowhead whale as an unthreatened species — just as they have done for thousands of years. Bowhead whaling is a cultural cornerstone of Iñupiat identity and a primary source of food on the Arctic Slope, where the cost of living is nearly three times that of mainland US. In spring of 2016, I spent 5 weeks standing on the sea ice as a guest of a whaling crew. 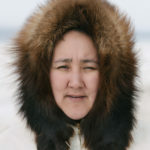 As an indigenous person, I wanted to understand and document their subsistence life in the Arctic, where the danger of cultural death is just as imminent as an attack from a polar bear. This video is a set of impressions of the stark and beautiful world on the sea ice. My crew stands on the ice next to our skinboat. We wait for the return of the bowhead whales, and give thanks to the gift of the whale for feeding an entire community. We watch, day and night, as starving polar bears try to catch us unawares, and the ice melts under our feet. 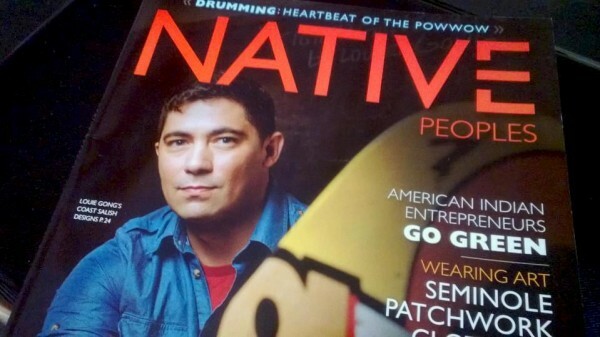 Native artist Louie Gong, who runs 8thgen, was featured on the cover of Native Peoples this month. We did this shoot a year ago and Louie still looks good, with his hybrid street art/nw coast/asian style on a skateboard deck. I still don’t have a copy yet so here’s what Louie texted me.